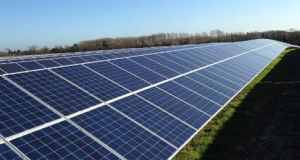 Solar Farms; Growing the Future of Clean Energy -D.E.N.J, Inc. In 1956 Issac Asimov, the most prolific science-fiction writer of the mid 20th century, penned a short story called ‘The Final Question’. The tale explored a far distant future where humanity had discovered a means of harnessing the near infinite energy of the sun as a means to generate a clean and limitless source of power. This great discovery freed humanity from the struggle to balance progress against limited resources and ultimately leads us to develop the ability to leave the bounds of Earth and colonize the stars. While the greater scope of Asimov’s grand vision has not yet come to pass, a small part of his dream has come true. Solar power is no longer an imagining of fiction writers; it is a very real and very important aspect of renewable energy initiatives. There are over 70 solar farms across the globe, each with a minimum net capacity of 50 megawatts, and some as high as 590 megawatts. The U.S. accounts for 20% of these solar farms. All told, the current power output of the world’s solar farms is equal to over 50 conventional coal power facilities. Solar farms are large scale photovoltaic systems consisting of hundreds or even thousands of solar panel arrays. Unlike residential solar panel arrays, which are designed to supplement an individual home’s energy needs and reduce reliance on outside energy production, solar arrays in solar farms are linked in circuit to produce much larger quantities of usable energy that is then supplied directly into the local power grid. Regardless of whether a solar panel is affixed to a single home or as a network of similar panels in a solar farm, the process by which the panel converts solar radiation into usable energy is the same. 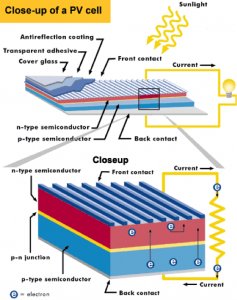 Solar panels are built of a network of crystalline silicon or cadmium telluride film cells. These materials, when struck by solar radiation, convert protons found in the sun’s rays into electrons; a process which produces an electrical current that is transported to the grid’s power converter and transformed into usable energy. Crystalline silicone based panels are known to produce a greater amount of power per square inch of surface area, but are more expensive to produce than the cadmium telluride based alternative. For this reason, most of the residential roof-mounted solar arrays you may see are of the cadmium variant, while the panels that make up a solar farm are often made of the more costly crystalline silicon. How an individual P.V. cell in a solar farm functions. Despite the quantum leap forward in power production that solar power represents, solar energy production only accounts for a tiny fraction of the world’s energy needs. According to the U.S. Energy Information Administration, energy produced in solar farms represented a mere 0.7% of global energy production in 2013. While this number is expected to grow significantly over the next decade, projections for 2025 still put global solar farm energy production at a modest 2.5% of global needs. Projections for 2050 bump this percentage closer to 15%. As clean energy initiatives grow in size and scope over the coming years, the role that solar farms play in providing power to the energy users of the world will similarly expand. We may not have caught up to the imaginings of a mid-twentieth century fiction author, but we’re getting closer every day. In fact, one might say that the future looks quite ‘bright’ indeed!